When Nissan first released the GT-R it was a complete show-stopper. The production version of the GT-R debuted at the 2007 Tokyo Motor Show, launching in the Japanese market on December 6, 2007. The U.S. official launch was seven months later on July 7, 2008. I have driven the early cars and the performance was just staggering. There was a dial to show how much power you were putting to the front wheels compared to the rear. It became the ‘gold standard’ in saloon car racing, and the GT-R became known as Godzilla, winning everything. In typical form however, CAMS (the guiding body for racing in Australia) then promptly outlawed it! The new version (for 2021) features a hybrid unibody assembled on ultra-low-tolerance jigs similar to those used in racecar construction. Alcoa aluminum is used for the hood, trunk lid and outer door skins, with die-cast aluminum front shock towers and inner door structures. Outer body panels are stamped using multiple-strike coining process for added rigidity and precision. The chassis is stiffened with a carbon-composite front cross member/radiator support. Nissan design boss Alfonso Albaisa has confirmed the next-generation Nissan GT-R will be the “fastest super sports car in the world” when it’s finally introduced in around 2021. 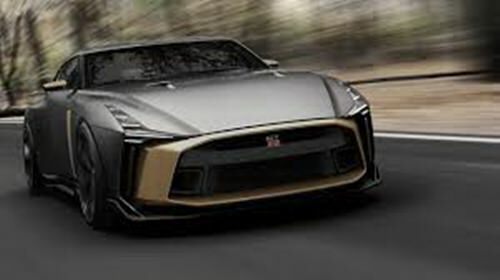 Confirming that the new Nissan GT-R is in the early phase of design and engineering, Albaisa told Brit magazine Autocar that, internally, engineers are yet to decide how much electrification the Japanese supercar will come with, but that it was ‘likely’ to have a hybrid power. Talking at the Goodwood Festival of Speed this year, the car-maker’s design boss was supposed to be there to launch the limited-run $1.4 million-plus GT-R50 by Italdesign but, despite the presence of the new special-edition, was happy to talk about the R35 GT-R replacement. Interestingly, Albaisa was keen to stress the next GT-R would not take any design cues from the GT-R50. Nissan’s design chief said that the future GT-R would retain a visual identity that’s unique among cars of its kind and that he was keen to keep the ‘brick’-like stature of the current car. Despite the design process being well under way, Albaisa says the final styling of the GT-R is far from approved because serious work can’t begin until key decisions have been made. Chief among them are decisions by engineers who have yet to finalize the powertrain, which has a knock-on effect on the next Nissan supercar’s all-new architecture. I have been advised that even if an engineering package was decided this year the extensive development time needed to hone the Japanese supercar would mean an on-sale date of 2021, at the earliest. Whenever it arrives, electrification is almost a no contest if Nissan is to achieve its aim of producing enough power to make the new GT-R the world’s fastest super sports car while meeting emission requirements. Helping inspire the next-gen GT-R will no doubt be the twin-turbo 3.0 liter V6 hybrid powertrain that Nissan created — but didn’t use — for its stillborn LMP1 GT-R race car that was set to compete in the 2016 World Endurance Championship before the car-maker pulled the plug on the campaign.